Twisted Diamond Halo Engagement Ring - 14kt white gold, twisted, diamond halo engagement ring. There are 70 round brilliant cut diamonds set around the center stone & down the side of the ring. The diamonds are about 0.22 ct tw, VS1-2 in clarity and G-H in color. Center stone is sold separately and ring can be made for any size. The stone pictured here is a 1.0 carat size. Twisted Diamond Halo Engagement Ring - 18kt white gold, twisted, diamond halo engagement ring. There are 70 round brilliant cut diamonds set around the center stone & down the side of the ring. The diamonds are about 0.22 ct tw, VS1-2 in clarity and G-H in color. Center stone is sold separately and ring can be made for any size. The stone pictured here is a 1.0 carat size. 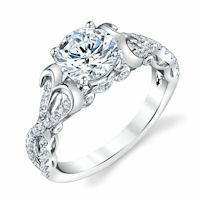 Twisted Diamond Halo Engagement Ring - Platinum, twisted, diamond halo engagement ring. There are 70 round brilliant cut diamonds set around the center stone & down the side of the ring. The diamonds are about 0.22 ct tw, VS1-2 in clarity and G-H in color. Center stone is sold separately and ring can be made for any size. The stone pictured here is a 1.0 carat size. Floral Diamond Halo Engagement Ring - 14kt white & rose gold, floral design, diamond halo engagement ring. There are 34 round brilliant cut diamonds set in around the center stone and the sides of the ring. The diamonds are about 0.26 carats total weight, VS1-2 in clarity and G-H in color. Center stone is sold separately and in other sizes. Pictured here is about a 1.0 carat diamond. 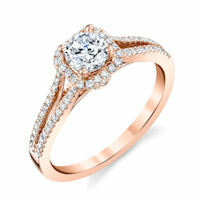 Floral Diamond Halo Engagement Ring - 18kt white & rose gold, floral design, diamond halo engagement ring. There are 34 round brilliant cut diamonds set in around the center stone and the sides of the ring. The diamonds are about 0.26 carats total weight, VS1-2 in clarity and G-H in color. Center stone is sold separately and in other sizes. Pictured here is about a 1.0 carat diamond. 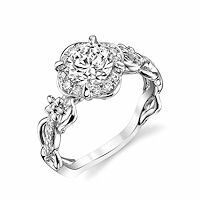 Floral Diamond Halo Engagement Ring - 14kt white gold, floral design, diamond halo engagement ring. There are 34 round brilliant cut diamonds set in around the center stone and the sides of the ring. The diamonds are about 0.26 carats total weight, VS1-2 in clarity and G-H in color. Center stone is sold separately and in other sizes. Pictured here is about a 1.0 carat diamond. 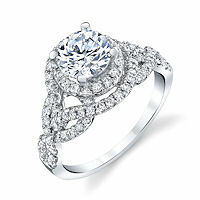 Floral Diamond Halo Engagement Ring - 18kt white gold, floral design, diamond halo engagement ring. There are 34 round brilliant cut diamonds set in around the center stone and the sides of the ring. The diamonds are about 0.26 carats total weight, VS1-2 in clarity and G-H in color. Center stone is sold separately and in other sizes. Pictured here is about a 1.0 carat diamond. 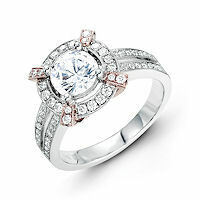 Floral Diamond Halo Engagement Ring - Platinum, floral design, diamond halo engagement ring. There are 34 round brilliant cut diamonds set in around the center stone and the sides of the ring. The diamonds are about 0.26 carats total weight, VS1-2 in clarity and G-H in color. Center stone is sold separately and in other sizes. Pictured here is about a 1.0 carat diamond. Vintage Princess Cut Halo Engagement Ring - 14kt white gold, vintage, princess cut, diamond halo engagement ring. There are 88 round brilliant & baguette cut diamonds set around the center stone and down the side. The rounds diamonds are about 0.68 ct tw and the baguette cut diamonds are about 0.15 ct tw; VS1-2 in clarity and G-H in color. Center stone is sold separately and in different sizes. Pictured is a 1.0 carat princess cut diamond. Vintage Princess Cut Halo Engagement Ring - 18kt white gold, vintage, princess cut, diamond halo engagement ring. There are 88 round brilliant & baguette cut diamonds set around the center stone and down the side. The rounds diamonds are about 0.68 ct tw and the baguette cut diamonds are about 0.15 ct tw; VS1-2 in clarity and G-H in color. Center stone is sold separately and in different sizes. Pictured is a 1.0 carat princess cut diamond. Vintage Princess Cut Halo Engagement Ring - Platinum, vintage, princess cut, diamond halo engagement ring. There are 88 round brilliant & baguette cut diamonds set around the center stone and down the side. The rounds diamonds are about 0.68 ct tw and the baguette cut diamonds are about 0.15 ct tw; VS1-2 in clarity and G-H in color. Center stone is sold separately and in different sizes. Pictured is a 1.0 carat princess cut diamond. Vintage Rose & White Gold Halo Engagement Ring - 14kt rose & white gold, halo, vintage diamond engagement ring. There are about 72 round brilliant cut diamonds set in the ring. The diamonds are about 0.54 ct tw, VS1-2 in clarity and G-H in color. Center stone is sold separately and in different sizes. Pictured is a 1.0 carat diamond. Vintage Rose & White Gold Halo Engagement Ring - 18kt rose & white gold, halo, vintage diamond engagement ring. There are about 72 round brilliant cut diamonds set in the ring. The diamonds are about 0.54 ct tw, VS1-2 in clarity and G-H in color. Center stone is sold separately and in different sizes. Pictured is a 1.0 carat diamond. Vintage Halo Diamond Engagement Ring - 14kt white gold, halo, vintage diamond engagement ring. There are about 72 round brilliant cut diamonds set in the ring. The diamonds are about 0.54 ct tw, VS1-2 in clarity and G-H in color. Center stone is sold separately and in different sizes. Pictured is a 1.0 carat diamond. Vintage Halo Diamond Engagement Ring - 18kt white gold, halo, vintage diamond engagement ring. There are about 72 round brilliant cut diamonds set in the ring. The diamonds are about 0.54 ct tw, VS1-2 in clarity and G-H in color. Center stone is sold separately and in different sizes. Pictured is a 1.0 carat diamond. 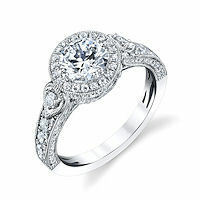 Platinum Vintage Halo Diamond Engagement Ring - Platinum, halo, vintage diamond engagement ring. There are about 72 round brilliant cut diamonds set in the ring. The diamonds are about 0.54 ct tw, VS1-2 in clarity and G-H in color. Center stone is sold separately and in different sizes. Pictured is a 1.0 carat diamond. Vintage Halo Engagement Ring - 14kt white gold, vintage, halo diamond engagement ring. There are about 82 round brilliant cut diamonds set in the ring with 2 round brilliant cut genuine sapphires on the sides. The diamonds are about 0.51 ct tw, VS1-2 in clarity and G-H in color with 0.10 ct tw genuine sapphire. Center stone is sold separately and in different sizes. Pictured here is a 1.25 carat diamond. Vintage Halo Diamond Engagement Ring - 18kt white gold, vintage, halo diamond engagement ring. There are about 82 round brilliant cut diamonds set in the ring with 2 round brilliant cut genuine sapphires on the sides. The diamonds are about 0.51 ct tw, VS1-2 in clarity and G-H in color with 0.10 ct tw genuine sapphire. Center stone is sold separately and in different sizes. Pictured here is a 1.25 carat diamond. 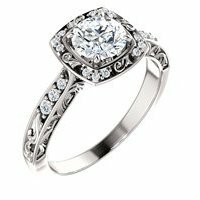 Platinum Vintage Halo Engagement Ring - Platinum, vintage, halo diamond engagement ring. There are about 82 round brilliant cut diamonds set in the ring with 2 round brilliant cut genuine sapphires on the sides. The diamonds are about 0.51 ct tw, VS1-2 in clarity and G-H in color with 0.10 ct tw genuine sapphire. Center stone is sold separately and in different sizes. Pictured here is a 1.25 carat diamond. Princess Cut Vintage Engagement Ring - 14kt white gold, princess cut, diamond halo, vintage engagement ring. There are about 86 round brilliant cut diamonds set around the center stone and in the ring. The diamonds are about 0.61 ct tw, VS1-2 in clarity and G-H in color. Center stone is sold separately and in different sizes. Pictured is a 1.0 carat princess cut diamond. Princess Cut Halo Vintage Engagement Ring - 18kt white gold, princess cut, diamond halo, vintage engagement ring. There are about 86 round brilliant cut diamonds set around the center stone and in the ring. The diamonds are about 0.61 ct tw, VS1-2 in clarity and G-H in color. Center stone is sold separately and in different sizes. Pictured is a 1.0 carat princess cut diamond. 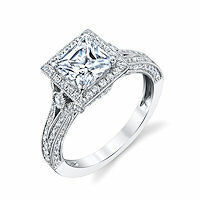 Princess Cut Engagement Ring - Platinum, princess cut, diamond halo, vintage engagement ring. There are about 86 round brilliant cut diamonds set around the center stone and in the ring. The diamonds are about 0.61 ct tw, VS1-2 in clarity and G-H in color. Center stone is sold separately and in different sizes. Pictured is a 1.0 carat princess cut diamond. Sculptural Diamond Engagement Ring - 14kt white gold, sculptural, diamond engagement ring. There are about 50 round brilliant cut diamonds set in the ring. The diamonds are about 0.33 ct tw, VS1-2 in clarity and G-H in color. Center stone is sold separately and in different sizes. Pictured is a 1.25 carat diamond. Sculptural Diamond Engagement Ring - 18kt white gold, sculptural, diamond engagement ring. There are about 50 round brilliant cut diamonds set in the ring. The diamonds are about 0.33 ct tw, VS1-2 in clarity and G-H in color. Center stone is sold separately and in different sizes. Pictured is a 1.25 carat diamond. Sculptural Diamond Engagement Ring - Platinum, sculptural, diamond engagement ring. There are about 50 round brilliant cut diamonds set in the ring. The diamonds are about 0.33 ct tw, VS1-2 in clarity and G-H in color. Center stone is sold separately and in different sizes. Pictured is a 1.25 carat diamond. 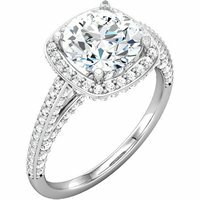 14K White Gold Diamond Halo Engagement Ring - 14kt white gold, diamond, scupltural, halo engagement ring. There are about 90 round brilliant cut diamonds set in the ring. The diamonds are about 0.55 ct tw, VS1-2 in clarity and G-H in color. Center stone is sold separately and in different sizes. Pictured is a 1.0 carat diamond. 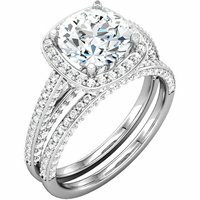 18K White Gold Diamond Halo Engagement Ring - 18kt white gold, diamond, scupltural, halo engagement ring. There are about 90 round brilliant cut diamonds set in the ring. The diamonds are about 0.55 ct tw, VS1-2 in clarity and G-H in color. Center stone is sold separately and in different sizes. Pictured is a 1.0 carat diamond. 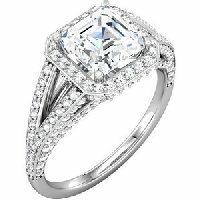 Platinum Diamond Halo Engagement Ring - Platinum, diamond, scupltural, halo engagement ring. There are about 90 round brilliant cut diamonds set in the ring. The diamonds are about 0.55 ct tw, VS1-2 in clarity and G-H in color. Center stone is sold separately and in different sizes. Pictured is a 1.0 carat diamond. Vintage Diamond Halo Engagement Ring - 14kt white gold, vintage, diamond halo engagement ring. There are about 122 round brilliant cut diamonds set in the ring. The diamonds are about 1.35 ct tw, VS1-2 in clarity and G-H in color. Center stone is sold separately and in different sizes. Pictured is a 1.0 carat diamond. Vintage Diamond Halo Engagement Ring - 18kt white gold, vintage, diamond halo engagement ring. There are about 122 round brilliant cut diamonds set in the ring. The diamonds are about 1.35 ct tw, VS1-2 in clarity and G-H in color. Center stone is sold separately and in different sizes. Pictured is a 1.0 carat diamond. Vintage Diamond Halo Engagement Ring - Platinum, vintage, diamond halo engagement ring. There are about 122 round brilliant cut diamonds set in the ring. The diamonds are about 1.35 ct tw, VS1-2 in clarity and G-H in color. Center stone is sold separately and in different sizes. Pictured is a 1.0 carat diamond. Round Halo Vintage Engagement Ring - 14kt white gold, round, halo, vintage diamond engagement ring. There are about 78 round brilliant cut diamonds set around the center stone and in the ring. The diamonds are about 0.66 ct tw, VS1-2 in clarity and G-H in color. Center stone is sold separately and in different sizes. Pictured is a 1.0 carat diamond. 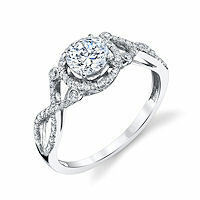 Round Halo Vintage Engagement Ring - 18kt white gold, round, halo, vintage diamond engagement ring. There are about 78 round brilliant cut diamonds set around the center stone and in the ring. The diamonds are about 0.66 ct tw, VS1-2 in clarity and G-H in color. Center stone is sold separately and in different sizes. Pictured is a 1.0 carat diamond. Round Halo VintageEngagement Ring - Platinum, round, halo, vintage diamond engagement ring. There are about 78 round brilliant cut diamonds set around the center stone and in the ring. The diamonds are about 0.66 ct tw, VS1-2 in clarity and G-H in color. Center stone is sold separately and in different sizes. Pictured is a 1.0 carat diamond. 18K Asscher Shape Engagement Ring With Halo. 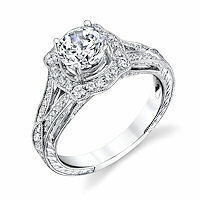 - 18K white gold halo style diamond engagement ring. Ring holds 150 round brilliant cut diamonds excluding the center stone. The diamonds total weight is 0.75ct and are graded as VS in Clarity G-H in color. Sculptural Engagement Ring - 14K white gold diamond engagement ring. The ring holds 18 round brilliant cut diamonds with total weight of 1/6ct. In the center the ring holds one round brilliant ideal cut diamond that weighs 3/4 ct and certified by GIA as SI1 in Clarity G in color. The ring can be made to different size diamonds. Sculptural Engagement Ring - 18K white gold diamond engagement ring. The ring holds 18 round brilliant cut diamonds with total weight of 1/6ct. In the center the ring holds one round brilliant ideal cut diamond that weighs 3/4 ct and certified by GIA as SI1 in Clarity G in color. The ring can be made to different size diamonds. Sculptural Engagement Ring - Platinum diamond engagement ring. The ring holds 18 round brilliant cut diamonds with total weight of 1/6ct. In the center the ring holds one round brilliant ideal cut diamond that weighs 3/4 ct and certified by GIA as SI1 in Clarity G in color. The ring can be made to different size diamonds. 14K Asscher Shape Engagement Mounting - 14K white gold halo style diamond engagement ring. Ring holds 150 round brilliant cut diamonds excluding the center stone. The diamonds total weight is 0.75ct and are graded as VS in Clarity G-H in color. Halo Engagement Ring - 18k white gold halo engagement ring. The ring holds pave' set 124 round brilliant cut diamonds with total weight of 3/4ct. The diamonds are graded as graded as SI in Clarity G-H in Color. The ring also holds one round brilliant ideal cut diamond in the center that is certified by GIA as SI1 in Clarity and H in color. Different diamond sizes are available. Halo Engagement Ring - Platinum halo engagement ring. The ring holds pave' set 124 round brilliant cut diamonds with total weight of 3/4ct. The diamonds are graded as graded as SI in Clarity G-H in Color. The ring also holds one round brilliant ideal cut diamond in the center that is certified by GIA as SI1 in Clarity and H in color. Different diamond sizes are available. Halo Engagement Ring and Matching Band - 14k white gold halo engagement ring and matching band. The ring holds pave' set 124 round brilliant cut diamonds with total weight of 3/4ct. The matching band holds 50 round brilliant cut diamonds with total weight of 0.25ct. The diamonds are graded as graded as SI in Clarity G-H in Color. 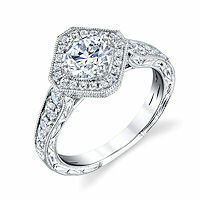 The ring also holds one round brilliant ideal cut diamond that weighs 3/4ct. in the center that is certified by GIA as SI1 in Clarity and H in color. Different diamond sizes are available. Halo Engagement Ring and Matching Band - 18k white gold halo engagement ring and matching band. The ring holds pave' set 124 round brilliant cut diamonds with total weight of 3/4ct. The matching band holds 50 round brilliant cut diamonds with total weight of 0.25ct. The diamonds are graded as graded as SI in Clarity G-H in Color. The ring also holds one round brilliant ideal cut diamond that weighs 3/4ct. in the center that is certified by GIA as SI1 in Clarity and H in color. Different diamond sizes are available. Halo Engagement Ring and Matching Band - Platinum halo engagement ring and matching band. The ring holds pave' set 124 round brilliant cut diamonds with total weight of 3/4ct. The matching band holds 50 round brilliant cut diamonds with total weight of 0.25ct. The diamonds are graded as graded as SI in Clarity G-H in Color. The ring also holds one round brilliant ideal cut diamond that weighs 3/4ct. in the center that is certified by GIA as SI1 in Clarity and H in color. Different diamond sizes are available. Halo Engagement Ring - 14k white gold halo engagement ring. The ring holds pave' set 124 round brilliant cut diamonds with total weight of 3/4ct. The diamonds are graded as graded as SI in Clarity G-H in Color. The ring also holds one round brilliant ideal cut diamond in the center that is certified by GIA as SI1 in Clarity and H in color. Different diamond sizes are available. Halo designs feature a ring of smaller diamonds surrounding a larger center diamond. This setting gives the illusion of a halo or ring that surround the center stone or diamond. 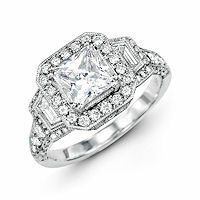 Round Brilliant, Princess, or Emerald cut and even Radiant-Cut are the most popular choices for stone shapes. This design style greatly increases the visual size of the center stone and adds interesting sparkle all around the main stone. This also adds a ring of protection for the large center stone protecting it. More Bling and Safer - very classy. One of the most famous Halo Wedding Ring was worn by Princess Diana & Kate Middleton: Blue Sapphire accented with Diamond Halo.